Autodiscover is a fundamental technology in Exchange and Office 365. When Outlook first starts the ‘out of the box experience’ is that it will first of all figure out if it can find an email address for you on the account you’re logged in with and then takes you through a wizard driven interface to ultimately run an autodiscover sequence. It takes the results of this query and first of all splits them into SCP records that have a keywords entry starting with ‘domain=’ and those that don’t have any ‘domain=’ keywords entries. If it finds an SCP where the domain= entry has your email domain after the equal sign then it uses the serviceBindingInformation attribute to either look in another LDAP (if the GUID in keywords was 67661d7F-8FC4-4fa7-BFAC-E1D7794C1F68) or post to a web service. It will then start with bucket 1 followed by 2 and finally 3 and tries each serviceBindingInformation link in turn looking for a valid response. Now if you’re not connected to Active Directory then this step is skipped altogether. This can be switched off with the ExcludeScpLookup registry entry. Using your email address autodiscover checks your email domain (the bit after the @ sign) and sends a post to https://emaildomain/autodiscover/autodiscover.xml This generally doesn’t yield a good result, in fact I don’t know why Microsoft chose to put this option 2nd and not 3rd… Anyway, generally this will either fail because there is no DNS entry for emaildomain or it hits your corporate web site, which is unlikely to have an autodiscover.xml file in the autodiscover directory. This can be switched off with the ExcludeHttpsRootDomain registry entry. Using your email address autodiscover checks your email domain with a preceding autodiscover, and it sends a post to https://autodiscover.emaildomain/autodiscover/autodiscover.xml. For an on-premises Exchange environment this often does yield a successful result. This can be switched off with the ExcludeHttpsAutodiscoverDomain registry entry. A local XML file can be placed in %LOCALAPPDATA%\Microsoft\Outlook and called autodiscover.xml. This xml file will then be read by Outlook and used to obtain settings for the user. This can be made the first method using the registry entry PreferLocalXML and adding a registry entry for the user’s email address of email domain and specifying the full path to the local XML file. Using your email address autodiscover checks your email domain (the bit after the @ sign) and sends a get to http://autodiscover.emaildomain/autodiscover/autodiscover.xml and it is looking for an HTTP redirect, i.e. a 301 or 302 status code telling it what URL to try next. This can be switched off with the ExcludeHttpRedirect registry entry. Finally autodiscover will look up an SRV record in DNS based on your emaildomain. It will look for _autodiscover._tcp.emaildomain and the host and port settings on that SRV record will tell it which URL and port to try to connect to. This can be switched off with the ExcludeSrvRecord registry entry. In Outlook 2010 Microsoft started to cache the last known good autodiscover URL in the profile so that they could refer back to that if needed in future. This can be switched off with the ExcludeLastKnownGoodUrl registry entry. This is a new method in Outlook 2016 which assumes that the email domain is on Office 365 and so tries three requests to confirm if this is an Office 365 hosted domain. This can be switched off with the ExcludeExplicitO365Endpoint registry entry. 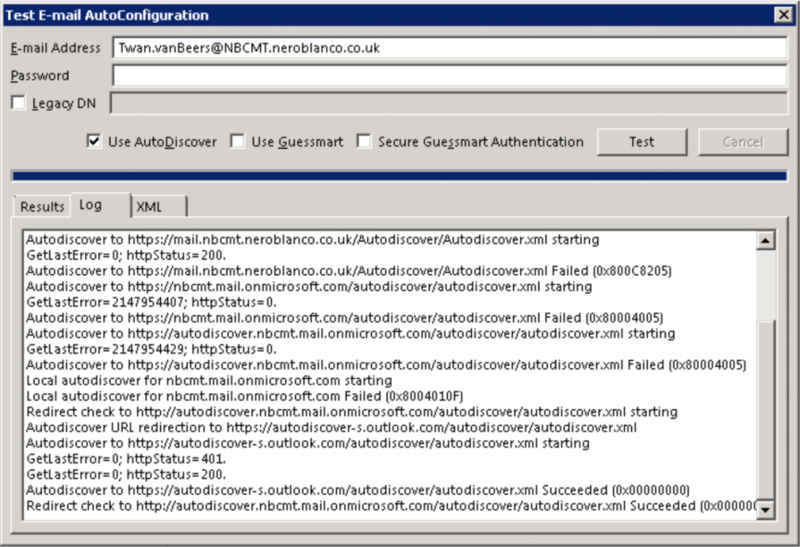 In a pure Exchange on-premises environment where Exchange is in the same forest as your user accounts then the ‘SCP method’ is most likely to give you a success (as long as Exchange is configured correctly) When you are at home then if your company has published Exchange to the Internet then the ‘autodiscover email domain via https’ method is likely to give you the right answer. 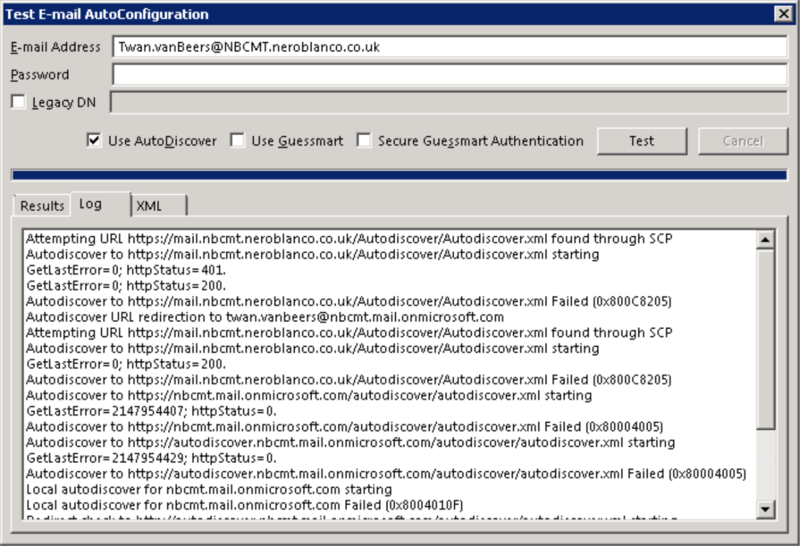 If your admin has NOT exported the SCPs then the next most likely option to succeed is again the ‘autodiscover email domain via https’ method. In Office 365 we’re asked by Microsoft to create an autodiscover.emaildomain CNAME in DNS and point it at autodiscover.outlook.com. This is so that the ‘Email domain via http method’ can get a redirect from autodiscover.outlook.com which will be autodiscover-s.outlook.com and sometimes it will then get another redirect to podXXXX.outlook.com before finally getting the settings it needs. Outlook itself has a Test Email AutoConfiguration tool, which can be accessed by finding the Outlook icon in your system tray and right-clicking on that icon while holding down the Control key. Using tools like Process Monitor from Microsoft/Sysinternals and Fiddler from Telerik we can see deeper into autodiscover. I’ve tested using the mail applet from control panel but you can use any tool that runs autodiscover and then trace them with Process Explorer and Fiddler. If you want to see inside the HTTPS stream then in Fiddler you’ll need to enable decryption and accept the prompts about trusting a self signed root certificate. This makes Fiddler your proxy server and it will pretend it is the website you’re after by creating a valid certificate on the fly and then establish a connection to the real web server on your behalf. This allows it to see inside of the encrypted HTTPS stream. Anyway I digress. Looking at Process Monitor and filtering to only RegQueryKey commands we can see that a number of registry key entries are checked. The majority of these have been mentioned above already but here is a summary of the ones that are in HKEY_CURRENT_USER\Software\Microsoft\Office\16.0\Outlook\Autodiscover (where the version number is the version of Office you’re using). ShowCertErrors Show an certificate errors like non-trusted, invalid time period, etc. There is also a subkey called RedirectServers which can be populated with one value per autodiscover host for which you do NOT want to be alerted about a redirect happening. By default Outlook will prompt the user to ensure they trust the redirection. That’s an excellent article, one-stop shop for Autodiscover. Excellent article Twan, thank you for putting it together. One thing has been bugging me ever since HTTP redirect: if I install a multi-tenant environment with the hosting domain being hosting.tld, and tenant domains tetant1.tld, tenant2.tld, … tenantn.tld, Outlook displays a certificate warning when the redirection occurs from autodiscover.tenant.tld to redirect.hosting.tld, regardless of the fact that the host domain is secured correctly. However I do NOT get a warning when the redirection occurs to O365. Do you know of any documentation which explains how HTTP redirect to O365 is different from my muti-tenant HTTP redirect and why redirecting to O365 doesn’t generate a cert warning? In my OOTB Office 2016 installation I have one entry for autodiscover-s.outlook.com under HKCU\Software\Microsoft\Office\16.0\Outlook\AutoDiscover\RedirectServers. Of course Microsoft has the ability to deploy that via updates to every machine in the world, whereas we can only ask users/organizations to add this manually. Thanks Twan, good point, didn’t think of that. Amazing write-up, thanks for taking the time! Thanks Bruun, glad you found it useful!